Physical features: This volcanic island is oval and not currently active. Steep coastal cliffs occur, especially on the western side, sloping to a central crater. The crater floor forms a large plateau at an altitude of about 600 m. Highest points on the island are remnants of the crater wall. Climate is oceanic. Mean annual temperature of 13 �C, rainfall of 1100 mm/yr, persistent westerly winds, and high humidity. Historical features: Île Amsterdam was discovered by Sebastian del Cano (on one of Magellan�s ships) in 1522, but was not landed on until 1696. Visited sporadically by explorers, sealers, scientists and crayfishermen in the 1700�s and 1800�s, and claimed by France in 1843. Cattle farming was attempted in 1871. 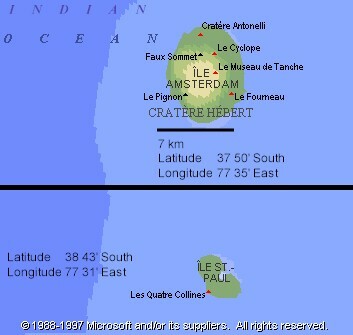 A French meteorological station was established in 1949-1950. There are no permanent residents. Physical features: This triangular shaped island is the summit of a volcano. Steep, 200 m high cliffs occur on the eastern side, 30 m cliffs on the other sides, sloping to a large crater rim at 200-250 m. Active thermal springs occur at two points around the crater. There are several offlying islets, rocks, and stacks. Historical features: The island was probably discovered in the 1600�s by a Dutchman, Harwich Claez. It was visited sporadically by explorers, fishermen and sealers in the 18th and 19th centuries. The island was the center of a fishing industry from 1843 till 1914. The island is uninhabited, but the area is visited frequently by fishermen.